Our slab fabrication department offers over 40 years combined experience in the industry. We specialize in custom fabricated kitchen and vanity stone countertops, fireplace cladding, shower surrounds and outdoor barbeques. 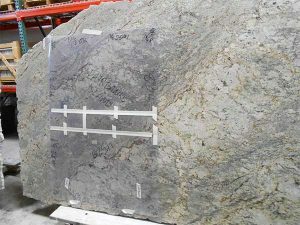 Our fabrication department is fully capable of fabricating natural stones like granite, as well as porcelain, engineered quartz and recycled glass. To provide you with a wide variety of natural and engineered stone slab choices, we work closely with the following natural stone slab importers and engineered stone wholesalers in Portland and Seattle. The slab fabrication process begins with a drawing or field measure, material selection and initial quote. On approval, we order the material you have selected and template. At template, we create physical templates of your project area to ensure a precise fit of the finished material. Our fabrication department then cuts and polishes the material to fit the needs of your job. Lastly, we install the product in your project area and seal if needed. We predict roughly a ten day turn-around from template to install and make every effort to make the transition to your new surface as smooth as possible. For remodels that are a little more time sensitive, we have the ability to template without demolition, so we can tear out and install the same day (when the original counter is laminate) and within two days (when the original counter is tile). We are also happy to schedule subcontractors such as electrical and plumbing. We are thrilled to know that our teams’ attention to detail and dedication to customer service has resulted in referrals and repeat business being our best form of advertising and compromising the majority of our work. View our slab selection guide and our gallery to see the outcome of our slab fabrication techniques.